Cake War on my last day! With my friend Laura. It’s only been like two days, but I miss all my friends already! On my last day of school, I had a good day. I wore my CocaCola pajamas to school, even though its against dress code. (what are they going to do, suspend me my last day?) I had a lot of support from friends and it made me feel better that I got a bunch of letters and 3 cakes, like nice whole big cakes!! 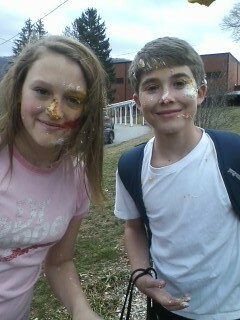 I got in an epic cake war with my friend Laura as you can see. They must’ve been happy to see me leave! (I hope not.) I know that I might have a good time but I am going to miss my friends no matter what. I hope you guys don’t forget me and I hope I can stay in touch somehow besides this blog. Hey Ben!!!!!!!!!!!! I miss you 1070000000000000000 billion times more than you could ever know haha u rocked those coke pjs!!!! Lol well I still want you to FaceTime me!!!!!! your my best friend forever!!!! !I love you!!!!!!!! Everybody misses you like crazy!!!! just so u know calling me Landry isn’t a insult 😉 haha math class!!! Well love you bye!!!!! BEN! dude it seems like you’ve been gone forever! we already miss you like…..we can’t explain how much. i love talking to you every day! sorry i couldn’t make you any food when you left but i made you a picture (which i better at than cooking). i hope you liked my picture 🙂 by the way band is not the same without you. school is not the same without you! Just read your blog and wanted to let you know I LOVE Coca Cola too!!!!! :)) Haha! Hope you are able to stay in contact with all your friends through this site and other ways. I’m sure they all miss you, but enjoy the great experiences you can make in South America. You’ll surely never forget it all your life.